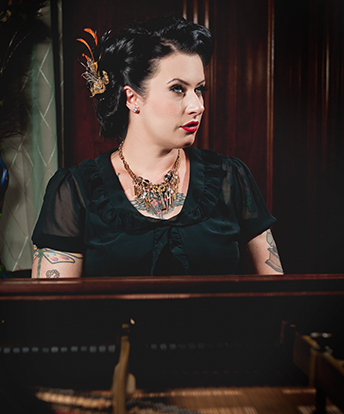 Since exploding onto the scene in 2005, Davina and the Vagabonds have grown from a down-and-dirty blues band into one of the most exciting acoustic ensembles on the international stage. This high-energy quintet has an ambitious full-time U.S. and international touring schedule. In recent years they have performed in 45 states, 2 Canadian provinces and 12 European countries. With influences ranging from Fats Domino and the Preservation Hall Jazz Band to Aretha Franklin and Tom Waits, the band draws from the last 100 years of American music. So much more than just a blues act, DATV’s shows are filled with New Orleans charm, Memphis soul swagger, dark theatrical moments that evoke Kurt Weill, and tender gospel passages. Davina’s voice and stage presence have been compared to Etta James, Amy Winehouse, Janis Joplin, Billie Holiday and Betty Boop, but comparisons don’t suffice. Sowers is a true original.